 Vagnsset med 3 personvagnar typ DB "Insider 2017"
Vagnsset med 3 personvagnar typ DB "Insider 2017"
By buying this product you can collect up to 4588 bonuspoints. Vagnsset med 3 personvagnar typ DB 'Rebuild Cars' 'Insider 2017', fabriksinstallerad innerbelysning, totallängd över buffertar 67,2 cm, epok III. Model: The 2nd class 'Umbauwagen' with a baggage area has Prussian standard design trucks, the 1st/2nd class 'Umbauwagen' has Minden-Deutz design trucks, and the 2nd class 'Umbauwagen' has American design 'Pennsylvania trucks'. Each car has factory-installed LED interior lighting and operating, current-conducting couplers. A pickup shoe is mounted on one car. A decal set with different car routings is included for each car. Length over the buffers per car 22.4 cm / 8-13/16'. The 41324 passenger car set is being produced in 2017 in a one-time series only for Insider members. The class 75.4 general-purpose tank locomotive to go with this car set is being offered under item number 39753 exclusively for Insider members. 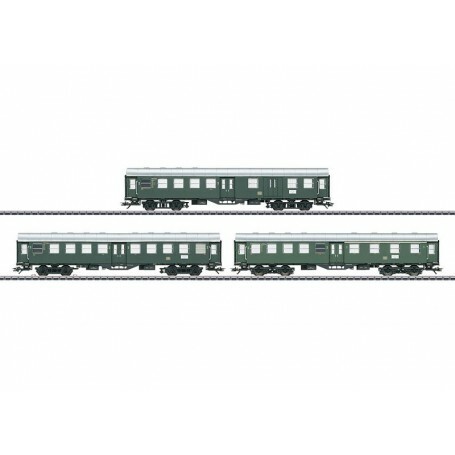 This passenger car set can be found in a DC version in the Trix H0 assortment under item number 23429 exclusively for Trix Club members.